Chess master Eric Schiller uses his decades of playing and teaching experience to break down every major chess opening and teach players near-foolproof openings and the four goals they try to accomplish in the early part of the game. Chess master Eric Schiller uses his decades of playing and teaching experience to break down every major chess opening, including the Fried Liver Attack, the French Defense, the Sicilian Defense, and of course, Fool's Mate. His goal is teach players near-foolproof openings plus the four goals they should accomplish in the early moves of the game. This easy-to-read book is filled with large diagrams, informative charts, and clear explanations and definitions. There are no variations to memorize—just a great opening approach from one of the most renowned chess teachers. If players have struggled to establish strong positions in their first few moves, the lessons in this book will immediately change that, and give them more confidence, more skills, and a winning game. 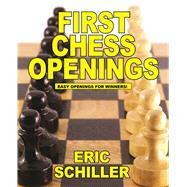 Eric Schiller is considered one of the world’s foremost chess analysts, writers and teachers. He is the author of more than 100 chess books including the World Champion Openings, Encyclopedia of Chess Wisdom, and Learn from Bobby Fischer’s Greatest Games.